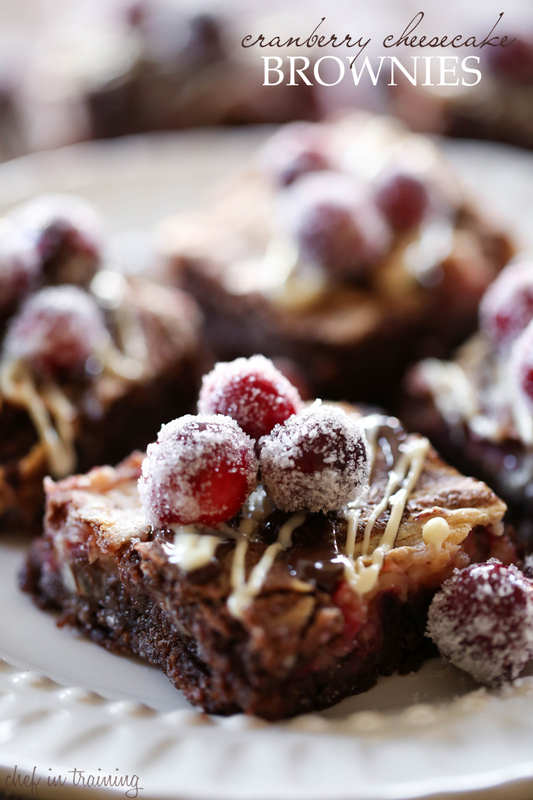 These Cranberry Cheesecake Brownies are something special! They are rich, delicious and packed with holiday flavor! Not to mention they are absolutely beautiful and a complete show stopper! Cream butter and sugar together. Add eggs and vanilla and blend well. Add salt, cocoa and flour and stir to combine. Don’t overbeat. In a medium bowl combine cream cheese, and sugar. Beat until smooth. Add egg. Beat again until smooth and creamy. Add vanilla and cranberries. Mix until well blended. Spoon half of the brownie batter in the bottom of a greased 9X13 pan. Pour the cream cheese mixture over the brownie batter. With a large spoon drop remaining brownie batter over cream cheese mixture and swirl with a knife. Bake at 350 for 30 to 35 minutes. Test doneness with a knife to see if it comes out clean. When done, remove from oven and let cool completely. Melt chocolates separately in microwave safe bowls with shortening in 30 second increments, stirring in between each increment until chocolate is smooth and melted. Drizzle chocolates over cooled brownies. Place cranberries in a medium bowl. Set aside. In a small sauce pan, combine sugar and water over medium heat until it reaches a simmer and sugar dissolves. Remove pan from heat and let it cool for 10 minutes. Once syrup has cooled for 10 minutes, pour the syrup over the top of cranberries. Let cranberries cool completely. Once completely cooled, cover with plastic wrap and refrigerate over night. The next day, drain cranberries. Place ¾ cup sugar in a shallow dish and add the cranberries in small batches coating well with the sugar. Remove from sugar and place cranberries on a a baking sheet. Let stand for 1 hour. Can be stored in an airtight container for 1 week in the refrigerator.